Pelenna Patchworks: Guess How Much I Love You 2018 & Lewis & Irene Fairy Lights! Guess How Much I Love You 2018 & Lewis & Irene Fairy Lights! We have two new ranges in stock that would be perfect for presents for little ones this Christmas! 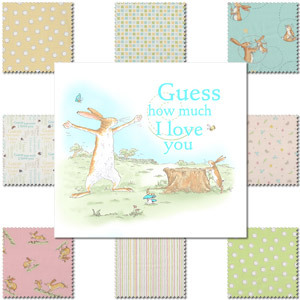 Starting with the new Guess How Much I Love You fabric collection by Anita Jeram for Clothworks fabrics - inspired by the classic children's book, these prints feature Little and Big Nut Brown Hare playing together, plus quotes from the book and a selection of beautiful coordinates. We have pre-cut bundles in neutral, blue and pink colourways (taking the work out of matching fabrics! ), plus a gorgeous quilt panel, ideal for quick and easy baby quilts and playmats. The other new range is the Fairy Lights fabric collection from Lewis & Irene - the frolicking fairies, dancing unicorns and glittering sparkles in this range are given an extra magical twist as they glow in the dark!